The writing was on the wall for a long time but Saturday April 21st marked the end of another chapter in the long-running Crosville Motor Services story. Although this is now old news, it deserves an airing here because of my involvement with the latter-day company. To recap, a combination of falling revenue and some difficulties with the Traffic Commissioner made it inevitable that the company would have to cease trading. The management of the Weston-super-Mare company decided to go out with a flourish, so organised a running day on the last day of operation. 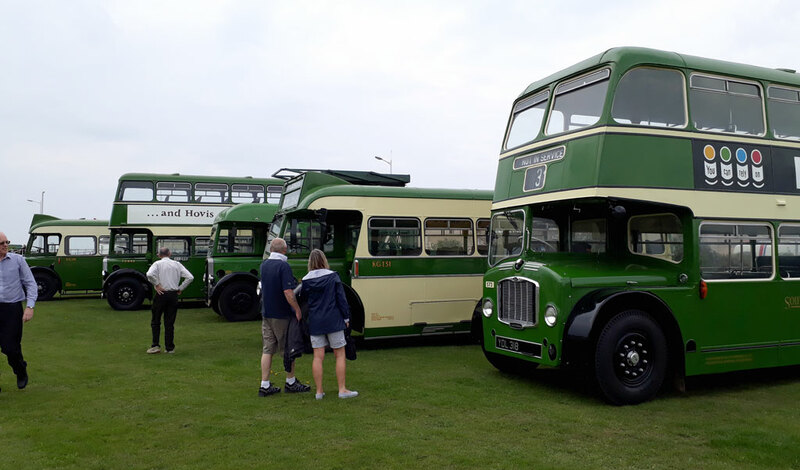 Based at the Beach Lawns on Weston’s seafront, heritage vehicles were either lined up on display or used in service on the 100 route to Sand Bay. With Crosville’s Sentinel steam bus ‘Elizabeth’ joining in the action as well, that meant that the road to Sand Bay got very busy at times! (Photo copyright Paul Jones, used with permission). Sadly I was committed elsewhere on that day so missed most of the action but did have a couple of hours to spare in the morning so I was able to help ferry some of the heritage buses out to the seafront site, including recently restored Bristol K6A HLJ44 and Bristol FS6G YDL318. Then it was time to put all the toys away in the box and go home. 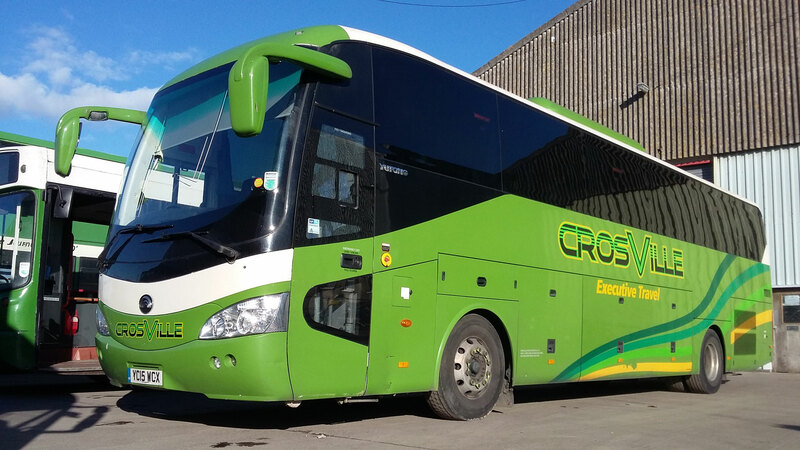 With local bus routes and private hire bookings unable to run due to the lack of an Operators Licence, the next few weeks were rather sad as the once-busy depot was gradually cleared out. Most of the service buses and coaches were sold off, either for further use or for scrap. I drove two ex-school contract vehicles, Leyland Tiger CRZ9853 and a yellow Dennis Javelin coach (whose number I have already forgotten), up to a coach trimmer near Banbury. In a final twist, each had only been bought for its seats. 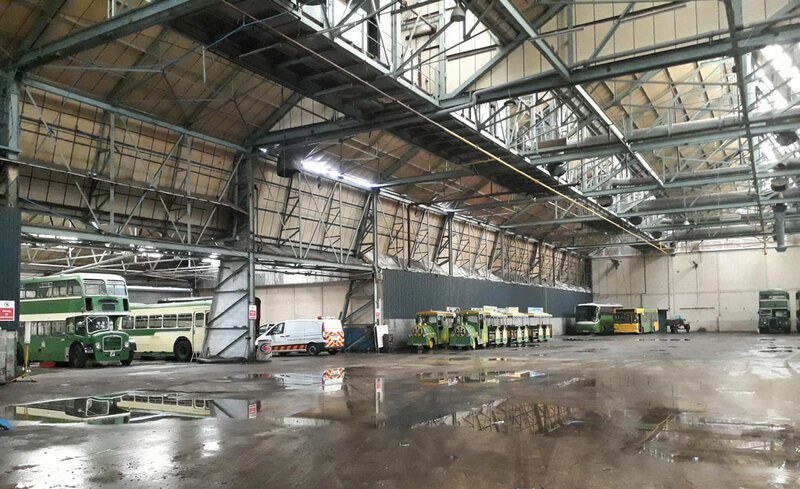 With most of the ‘modern’ vehicles sold, the vast hangar which served as the Crosville depot looked forlorn. There was a plan to continue running the heritage fleet, which had a healthy order book for 2018, under the auspices of Southern National (another JJP Holdings company) but this failed to materialise due to licencing issues. All bookings were cancelled and refunded. This had a direct impact on me because I had been, up to this point, managing the bookings and crew rosters for the heritage fleet. If you live near Weston-super-Mare you will already have heard that Crosville Motor Services is to close in April. Although it is a dark cloud, it does have a silver lining. It wouldn’t be right for me to go into detail here but, in a nutshell, Crosville has been struggling to survive financially for some time as costs have risen and subsidies have been cut. Even scaling back considerably last year didn’t produce enough savings to make the company viable. Town services 100 (Sand Bay) and 106 (Worlebury) will be withdrawn, school contracts will end and private hire coaches will no longer run. I have been involved in all but the 106 recently and I am grateful to Crosville for giving me work in these areas as well as looking after the heritage side of the business. The silver lining? The heritage buses will continue to run, as will the two Land Trains on Weston seafront, with yours truly involved as before. At this early stage nothing is 100% certain but Crosville has stated that these two elements of the business will continue after being transferred to another company in the JJP Holdings group. I’ll say no more at this stage but I am hopeful that, after Mrs Busman John and I uprooted ourselves from Torbay to move to Weston last year, it has not all been in vain. 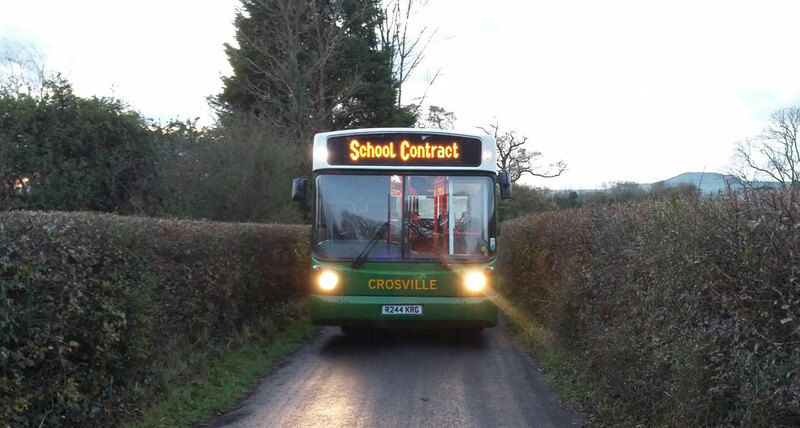 One of my many roles at Crosville is to drive school buses during term time in rural Somerset. These journeys have added some new challenges to my driving experience. By their very nature, school journeys tend to involve country lanes as we pick up students from outlying villages and bring them to school and back again. My first taste of school runs was route 724, which was very testing from the outset. My regular bus was Volvo B10BLE R244KRG, new to Stagecoach North East about 20 years ago. Leaving the garage at 07:15 I had a 35 minute empty journey ahead of me before picking up my first student. I drove a circular route through the lanes passing through villages and tiny hamlets such as Middle Stoughton, Chapel Allerton and Lower Weare before rejoining the main A38 and arriving in Cheddar just in time for school. In places the lanes are very narrow, with the bus often touching the hedges on both sides. The one pictured above is quite broad compared to some! 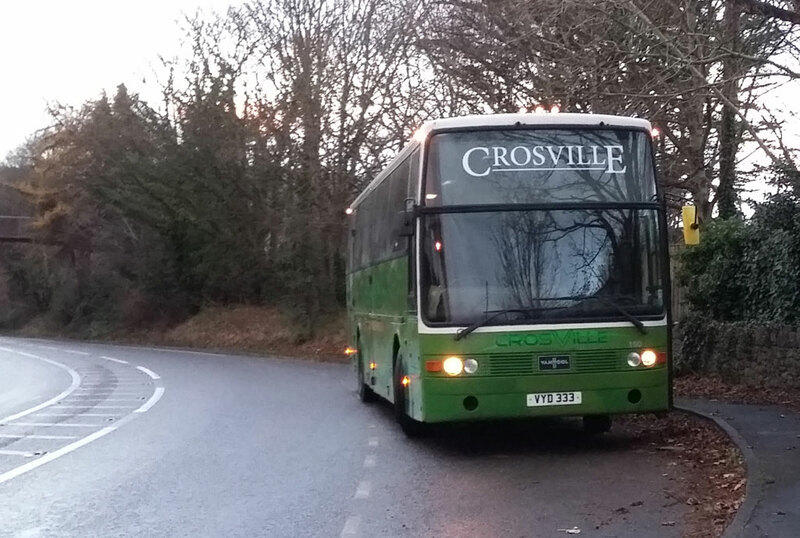 Fortunately my regular bus has automatic transmission and good all-round visibility, which made the task of manoevering around tight corners and oncoming traffic much easier than the occasions when I was allocated a full size modern coach. We no longer operate the 724 route which is a bit disappointing, as I had mastered its challenges rather well, even if I say it myself! The VanHool bodied DAF coach pictured left is now almost 25 years old and is now one of the stalwarts of the Crosville school contract and private hire fleet. It’s showing its age in places but still copes very well in service. As well as school duties, I also take on private hire duties with some of these vehicles. Sometimes a local school hires a coach for a short journey to the leisure centre or a group of residents take a trip to Bristol to the theatre. Occasionally I’ve been rostered to drive a bus service from Burnham-on-Sea to Wedmore. Until recently this included taking fares using the Ticketer system but now this service has been taken on by another operator. Just yesterday I was up at 04:30 (yawn) to do an early morning trip from Filton to Bridgwater College. This is a fairly simple duty which, apart from fighting my way through the rush hour traffic near Cribbs Causeway, Bristol, is mostly motorway running. I hope this gives you a flavour of some of my driving duties with the modern fleet. Not all are as old as those pictured – also yesterday I was driving a 2015 Yutong coach. Very nice! In between these driving duties I look after the private hire enquiries and bookings, both heritage and modern. 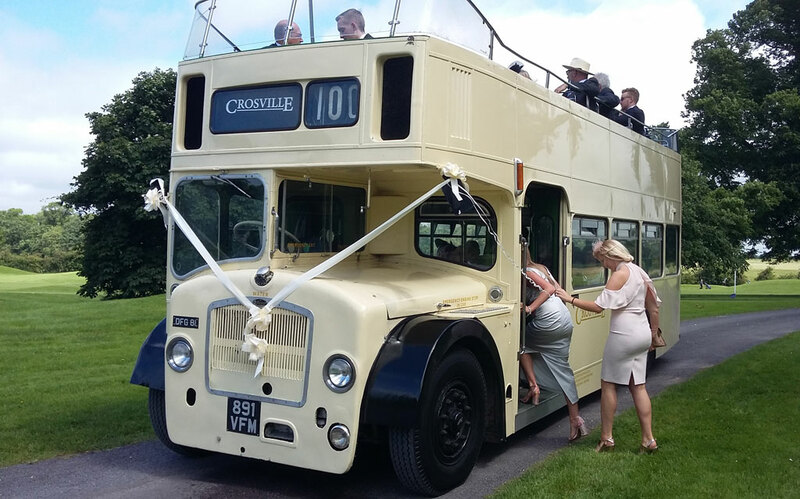 People are booking vintage buses for weddings up to one year in advance! Part of my role involves marketing the heritage fleet and recently we’ve teamed up with First Choice Wedding Cars, where three of our buses are featured. We’re also due to take a bus to Leigh Court, near Bristol, for a Wedding Fair early next year. Although heritage bus outings are less frequent now, we’re still operating. Last Saturday I was out in Bristol doing a wedding and there are a couple of vintage buses out next Saturday as well. In my next post I’ll highlight a few of the more notable turns this autumn/winter. In all my adventures as a bus driver I never thought I would find myself driving a train. A few days ago I did, but it’s not the kind of train you would expect. 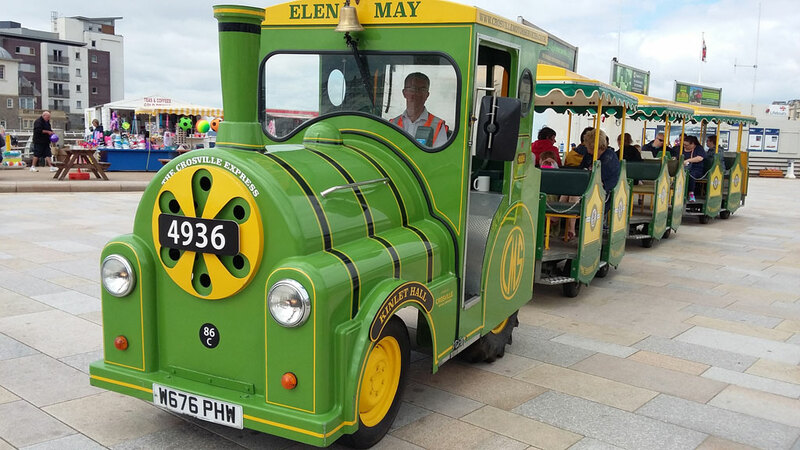 Although Crosville owns two full sized steam locomotives, my duty was to drive the diminutive Land Train up and down the promenade at Weston-super-Mare. It was the first time I’d driven such a thing so one of the Crosville managers gave me a brief introduction to the weird machine before I took it for a spin around the estate to get the hang of it. Underneath the glassfibre outline lies a small tractor, of the kind you would expect to find on a fruit farm. It’s powered by a three cylinder diesel engine and has three forward gears. Only one of these is ever used and, flat out, it can probably manage 8mph! To be fair, I wouldn’t want to go any faster for fear of the three trailers tipping over. Unladen, they are prone to wobbling about as my conductor James discovered when I powered through a few unexpected bumpy bits on the road down to the seafront! The whole assembly is remarkably neat when it comes to turning around, being able to turn on the proverbial sixpence. I practiced on the estate roads and found that, if I turned the tractor unit sharply to do a 180° turn, the cleverly engineered trailers all followed my path looking for all the world like a line of ducklings following their mother! After checking that all the lights were working properly, it was time to set off on what was probably the most hazardous part of the journey – the empty trip through the town to the promenade. I realised that I had to make all sorts of allowances for both the length and speed of the outfit I was driving. Particularly so when it came to emerging from junctions or entering roundabouts. I had to make sure that there was a BIG gap in the traffic! Passengers were few in the first part of the morning and my conductor James had an easy time. But soon the sun came out and so did the holidaymakers. We were soon carrying full loads as we trundled up and down the prom. The Land Train doesn’t run to a timetable as such and just goes to and fro on demand. The train uses the wide promenade pavement, which it has to share with pedestrians. As you can see from the photo above, the ‘loco’ carries a bell and I tended to use it frequently to alert other pavement-users to our presence. There are two of these trains, each of which carrying the identity of its mainline counterpart. The one I drove was linked to GWR ‘Hall’ class 4-6-0 locomotive No 4936 ‘Kinlet Hall’ which is currently undergoing a heavy general overhaul at Tyseley Locomotive Works. If there’s anything worse than driving a Bristol Lodekka in the middle of a heatwave, it’s driving a Lodekka with CBC cooling in the middle of a heatwave. On one of the hottest June days since the infamous summer of 1976, I had to endure the searing heat of not only the weather but also of the plumbing for the Cave-Brown-Cave cooling apparatus which passes through the driver’s cab. This came the day after an equally hot and energetic duty with Bristol FSF6G 891VFM on the 100 service to Sand Bay and, while I usually enjoy sunny days, I began to wish it wasn’t quite so hot. Together with my conductor Kevin, I prepared ex-BOC LC8515 (Bristol LD6B 972EHW) at the Crosville depot. The bus hadn’t been used for a week or so and was very reluctant to start. It needed a lot of persuasion and, as I sat in the cab teasing the Bristol AVW engine into life, I began to wonder if it would ever develop enough power to drag the bus out of the garage! Eventually the AVW settled down into its familiar burble so I left it running while we attached ribbons and bows which had been sent in by the customer. With all the checks completed we set off through Banwell, Churchill and Lower Langford. We arrived at Coombe Lodge with time to spare so we parked the bus in the turning circle and sought out some shade. Coombe Lodge is an attractive mansion built with local Bath stone, topped off with Cotwold tiles. It was originally the opulent country residence of the Wills family (founders of the W.D. & H.O. Wills Tobacco Company, based in nearby Bristol) and I was pleased to see that it retains a lot of wooden panelling. It’s not particularly ancient, being completed in 1932, but the pseudo-Jacobean style is well suited to its current use as a conference and wedding venue. Yesterday’s private hire duty was notable for taking me to some places with very limited clearance. It was a good test of my spacial awareness skills. The allocated bus was open top Lodekka DGF81 (FSF6G 891VFM), a genuine Crosville bus dating from 1961. I had spent most of the previous day in the office at Crosville and had time to check and fuel the bus so that I didn’t have to spend too much time early the next day in preparation. The pickup time was 10:30 at Orchardleigh House, near Frome so I allowed myself a generous 2 hours to make the empty journey. The most direct route was nevertheless a tortuous, rural one and my speed would rarely get above 30mph. In fact ‘limited clearance’ could apply to the outward journey quite easily as I trundled through the villages of Banwell, Sandford and Blagdon. There was plenty of hedge-hugging, double-declutching and wheel-heaving! Reaching West Harptree, I set off along the B3114 to eventually join up with the A39 at Chewton Mendip towards Bath. Briefly reaching 45mph, I soon went back down the box for the turning to Farrington Gurney, Midsomer Norton and Radstock. Somerset seems to have more than its fair share of double-barrelled place names and today I seemed to be visiting most of them! Finally, after passing through Buckland Dinham, I reached the imposing entrance to Orchardleigh House. I’ve been here before with a heritage bus and I recognised the twin stone-built lodges which stand guard over the gated entrance to the vast estate. The drive up to the house is almost a mile long and passes through a golf course on the way. I parked the bus near the Walled Garden and the complex of cottages in which most of the wedding guests had spent the previous night. I caught up with some of them on the lawn and learned that the celebrations had started the previous evening! Our buses are not decorated with ribbons as standard (although I plan to change that eventually) so some family members set to work with cream ribbons, bows and streamers of their own. 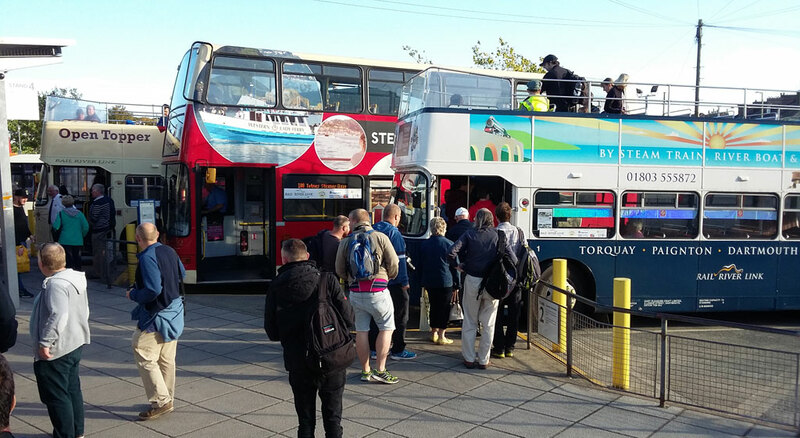 Last weekend saw the final runs in regular operational service for Torbay’s long-serving Bristol VRTs and I enjoyed a last fling with them on an evening Mystery Tour. Rail River Link (the bus operating division of the Dartmouth Steam Railway & Riverboat Company) has operated open top Bristol VRTs in the area since 2000 but now, due to the introduction next year of new regulations to bring all service buses into compliance with the Disability Discrimination Act 1995 (commonly referred to as ‘DDA’), the VRTs are being phased out. 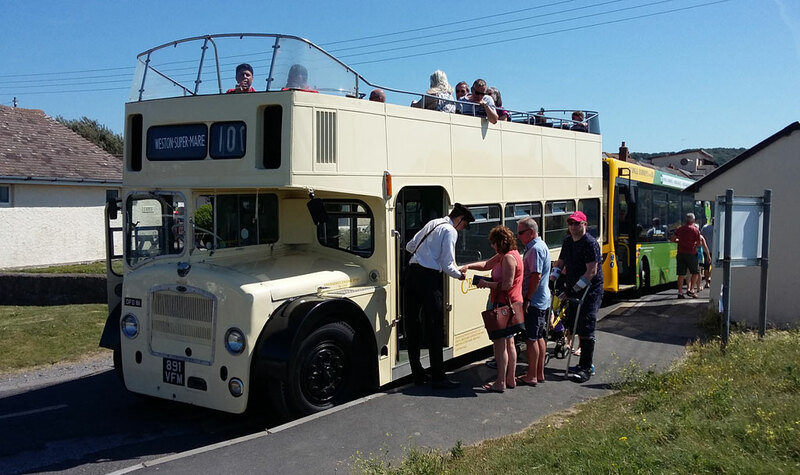 Jim O’Hara and his team of drivers delighted local transport historians and enthusiasts by putting on a weekend of extra services and Mystery Tours. 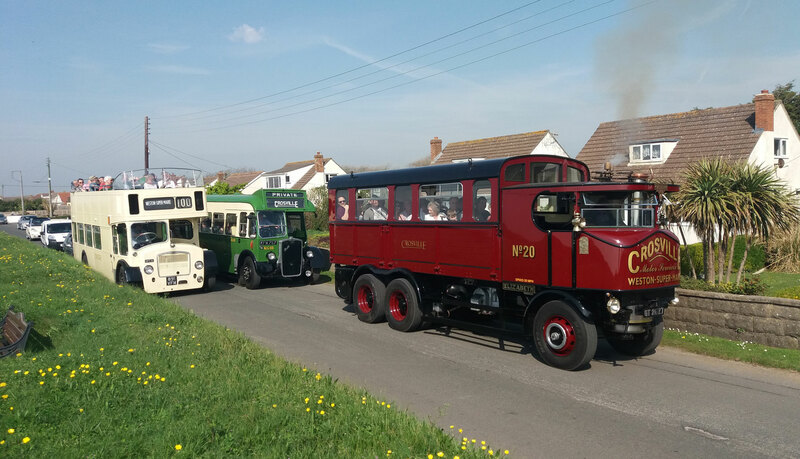 The 2 remaining RRL VRTs were joined by two other vehicles, another VRT supplied by North Somerset Coaches and a Leyland Atlantean which is owned by a local collector. I joined the party at Paignton Bus Station after returning from the afternoon Sightseeing Tour on the PD2 (FFY403). Incidentally, this was my final duty of the season as the Tours season also finished the same weekend. A good number of other people also waited near the 100 Service stop for the celebrity VRTs to arrive. A gentleman standing nearby started asking me about the buses which were due to take part and he revealed that he’d seen publicity about the weekend a few days earlier but didn’t know what a VRT was. Apparently he’d found the information he needed on a website written by a local chap who also drives for a company in Weston-super-Mare. Yes, he’d been reading this blog! Before long 2 of the VRTs had joined a Volvo B7 which was also in the station on the 100 run. I decided to take a ride on VDV138S for the first part of the tour. This was especially poignant because the bus (no 4 in the RRL fleet) was originally named ‘Warspite’ and was part of a batch of convertible Bristol VRTs supplied to Western National in 1977 as its 938 for service in Torbay. These buses replaced the ageing Leyland Atlantean ‘Sea Dog’ open toppers and happily several members of both types of bus have survived. Joining the fun for the weekend was VDV134S, now in Southern National NBC livery and carrying the name ‘Thomas Hardy’. To complete the set, as it were, one of the aforementioned ‘Sea Dog’ Atlanteans joined the convoy not long after we had left the bus station. 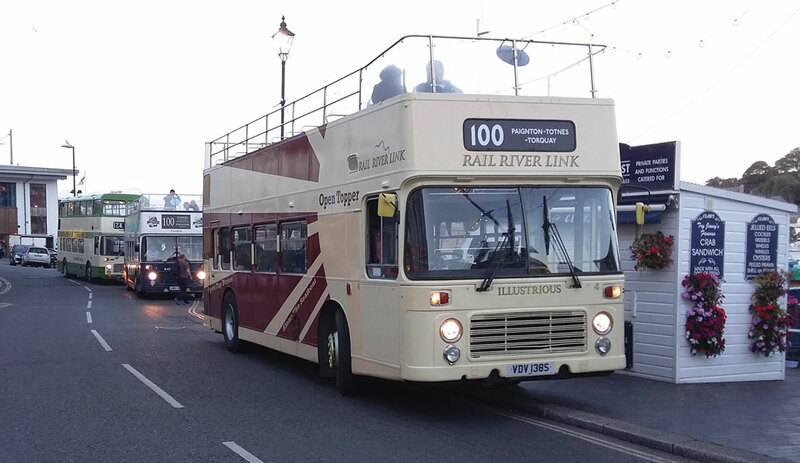 Now registered MSJ499, it was originally 925GTA in the Devon General fleet and it has been returned to DG’s reversed cream and maroon livery, complete with ‘Admiral Blake’ name.